The qualification process for the 2012 European Championship in Poland and Ukraine is finally over an all eyes will now turn to the group stage draw for the finals. The 16 qualified teams will now be divided into four separate pots, based on their record in competitive UEFA matches over the past four years. The teams will then be grouped randomly with each group being comprised of a team from each pot. 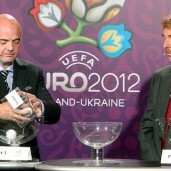 The draw will be held at the Ukraine Palace of Arts in Kiev. However, with the two host nations being granted first-pot status to ensure home-field advantage, the Draw offers more intrigue than normal and high potential for one or more ‘Groups of Death’. 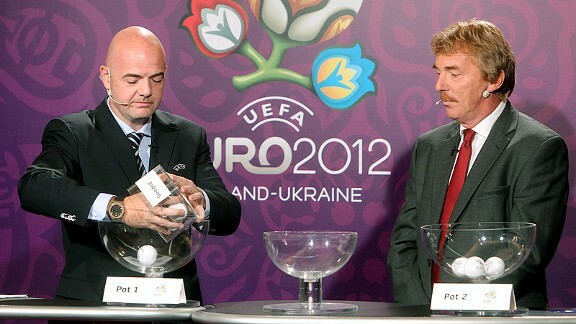 Teams in Pot One (the top-seeds, effectively) include: The Netherlands, Poland, Spain and Ukraine. Spain comes in as a top seed largely thanks to its status as defending Euro and World Cup Champions. The Netherlands – in addition to a strong 9-1 record in qualifying – were the runners-up at the 2010 World Cup as well. Pot Two is comprised of many of the traditional European powerhouses including England, Germany and Italy with Euro 2008 semi-finalists Russia rounding out the group. Pot Three features Croatia, Greece, Portugal and Sweden. While the final pot features Denmark, The Czech Republic, France and Ireland. With the random nature of the Draw, therefore, it is possible that Spain, England, Portugal and France could all find themselves in the same group battling for just two quarter-final berths. With Poland and Ukraine being among the lowest-ranked teams in the tournament, however, it is possible that the luck of the draw will find balance by giving them some of the tougher low-seeded teams like Portugal or Croatia. But in the end, it’s the luck of the draw.